Preheat the oven to 200°C (400°F) and line a 21 x 9 cm (81/4 x 31/2 in) loaf (bar) tin with baking paper. 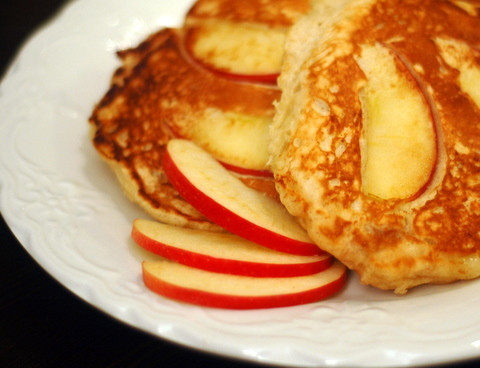 In a medium bowl, mix three-quarters of the apple slices with the stevia and lemon juice. In a separate medium bowl, whisk the eggs, then mix in the flour, coconut milk, almond milk, salt and apple mixture. Let the batter rest for 10 minutes, then pour into the prepared tin. Top with the remaining apple slices, then sprinkle with the cinnamon and nutmeg. Bake for 20–25 minutes, until set. Leave to cool for 10 minutes, cut into portions and serve warm. Letting the batter rest for 10 minutes before using is a good exercise in patience and results in a smoother mix and even hydration. This works for both baked and pan-cooked pancakes.